Original founders Harry and Mark with their first truck on a bright spring morning! 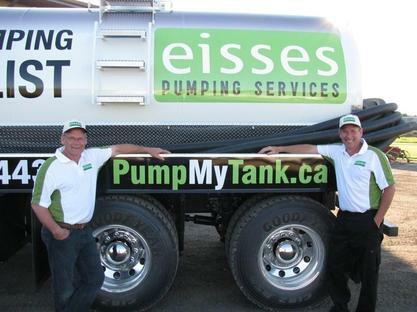 Pump My Tank is a customer focused septic pumping business based in Innisfil, Ontario. In 2010, seeing an opportunity to serve the residents of Simcoe County Mark Goodman and Harry Eisses started with a single truck and a vision to build a company that would be a leader in the industry and offer superior customer service. With a little sweat and a lot of learning along the way the business began to grow and within a few years another truck was on the road. Mark ran a successful lawn care company called Enviroking for several years and that experience earned him a clear understanding of how to make happy customers by delivering speedy service with a friendly smile and being sure to explain the process along the way. Harry brought a wealth of experience in a variety of fields that help bring focus and discipline to the operation. Fast forward to 2017 and “Eisses Pumping” became Pump My Tank, so many customers thought this was our name all along! By 2017 there were three trucks on the road full time with a busy service schedule of commercial and residential customers. 2017 also saw the exit of founding partner Harry Eisses who moved on to focus on his other interests he remains friends with the business to this day. We believe that honesty and integrity are business essentials and our reputation speaks for itself. You can count on us to deliver professional and courteous service every time we pump your septic tank. We are committed to the health of the environment and are fully compliant with all Ministry of the Environment regulations. We have state of the art equipment and protocols to ensure that all of our business practices are environmentally responsible. At the end of the day we have one simple goal: to be the best septic tank pumping company around and we are ready to prove it to you!